Twins Patrick and Katie Brady love being Catholic, but sometimes they struggle to live up to their faith. When these situations arise, suddenly they find themselves whisked back in time to meet saints who help them rediscover God's love in a deeper way. In the first adventure, The Secret of the Shamrock, Patrick gets in trouble with his parents and priest after he brings his pet frog, Francis (named for the Pope! ), to his newly adopted sister's baptism. To make up for his mistake, Patrick and his family join the parish Cleaning Team, but before he gets much cleaning done, Patrick is sent back in time to spend a few days with his patron saint, St. Patrick. 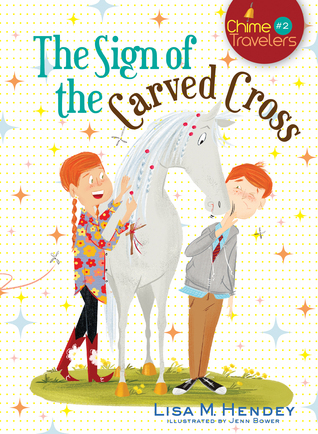 In the second book, The Sign of the Carved Cross, Katie is struggling to stand up to the mean girls in her class, who are purposely excluding a new girl. When she is sent back in time to 1675 New York, it is St. Kateri Tekakwitha who teaches Katie how to welcome a newcomer, and how to love herself as God does. Lisa Hendey's website, CatholicMom.com, has been a huge help to me in planning CCD lessons as I have taught on and off over the last 10+ years. That's why I was so excited to see not just a Catholic chapter book series (a very rare find), but one with her name on the cover! These books, collectively known as the Chime Travelers series, are perfect for Catholic kids in the early elementary grades, especially those who are studying the saints. The books are illustrated with full-page black and white drawings, and have short chapters that break up the story into easy-to-digest scenes. The premise of the series - traveling back in time to meet saints - is the perfect way to help kids get to know the holy men and women who serve as their role models in the faith without forcing them to read dry, boring textbooks. Each story is based on known facts about the central saint's life, but the fictional stories in which the information is embedded are more engaging than any religion textbook I have ever used. An author's note at the end of each book also provides useful follow-up information, including a brief biography and prayers associated with the saint, which teachers and parents can use to flesh out their lessons after the story is over. 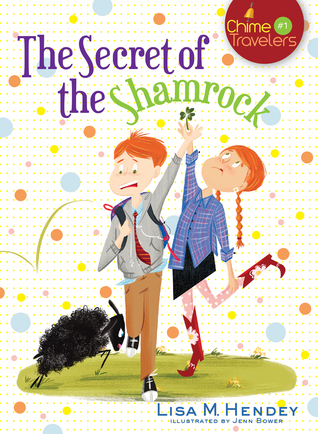 As for the characters, Patrick and Katie are wonderful Catholic role models, but they are not too perfect or too preachy, so kids can relate to them. Their family includes a father who has recently converted to the church, and a baby girl adopted from Vietnam, and Father Miguel, their pastor, is a friendly and approachable man who really normalizes priests and the priesthood. The twins themselves are also perfect complements to each other, as Katie is more pious and careful, while Patrick is more skeptical and impulsive. Sometimes having twins as the main characters of a story seems gimmicky, but in this case, having these two different personalities espouse the same religious faith is a great way to show kids the many correct ways to be a Catholic. Catholic schools (and their libraries) and Catholic homeschoolers will absolutely want to purchase this series. While Catholic children can certainly learn a lot from non-religious reading material, there is something special about also having a series on their bookshelves that is explicitly about the things they experience (baptisms, going to Confession, attending Mass, etc.) that are typically not represented (at least not accurately) in secular books. For that reason, these would also make wonderful gifts for First Holy Communion. For similar (secular) chapter book series, try Magic Tree House, Recipe for Adventure and Greetings from Somewhere. Also look for books 3 and 4 of the series, which will focus on St. Francis of Assisi and St. Clare, respectively. Shared this with one of our teachers who also does a 2nd grade PSR (?) clas, and she was thrilled. Shared this one of our teachers who also teaches a second grade PSR (?) class, and she was thrilled. Where I grew up, almost everyone was in CCD, but no one could ever tell me what the initials stood for!